A few years ago I gave a presentation as part of a writing and editing course about the linear trajectory from Ernest Hemingway to Jonathon Franzen. Papa is a fave of mine - all that drinking, all that missing dialogue - and at the time I couldn't stop thinking about The Corrections, so I decided to join the dots between them. My theory was that Hemingway's sparsity, coupled with realism, sent literature onto a path that arrived at hyperrealism, of which Franzen was an early proponent. Just as Hemingway, Fitzgerald, Steinbeck et al would have made for a formidable group of scribes about town, Franzen has picked up a posse of 'same breath' writers - Dave Eggers and this review's subject, Jonathan Safran Foer, being but two. What links them is this post-post-modern re-imagining of what a story is, of what a reader can expect from a novel. While they're messing about with language and chronology, they're also muddying the waters of fiction, giving us tomes laden with backstory and light on action (Franzen), presenting truth as fiction and stories as history (Eggers), and blending narratives to bring the author into the story, as Foer does in Everything is Illuminated. I loved Extremely Loud and Incredibly Close, his second novel, which focuses on a young boy whose father died in the World Trade Centre on 9/11. It's breathlessly emotional. 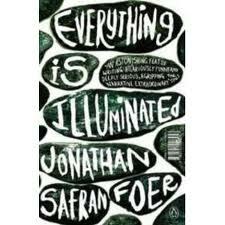 Everything is Illuminated is the work of a wunderkind, a first novel that won as many awards as it has parallel storylines. Within the novel, a character called Jonathan Safran Foer travels to the Ukraine to find a woman in a photograph, who saved his grandfather during the war. He is accompanied on his search by Alex, a young Ukrainian, who will translate for him. Ostensibly, Jonathan is writing a story of the history of the vanished village of Trachim, making up one strand of the book, which Alex is translating and vetting. Alex's letters to Jonathan, commenting on what has gone before, make up another strand. In between these are the peculiarly enunciated, minimally punctuated goings-on of Alex, Jonathan and Alex's grandfather as they hunt out Trachim and the elusive Augustine. Alex's imperfect English is a perennial feature - he feels 'oblongated' to Jon-fen, for example, and 'roosts', rather than sits. At first, I felt I'd have to skip the travel narrative contributed by Alex. It had every hallmark of too-clever writing, with the messed-about punctuation (running dialogue along single lines), and misused words making the reader do the work to uncover the story. The historical storyline of the inhabitants of Trachim stopped off on the Hemingway-Franzen highway to pay homage to the magic realism of Gabriel Garcia Marquez. I soon settled into the groove of that narrative, and was placated to find that it wasn't merely my lazy reading that meant I missed the relevance of some plot elements - to reveal all the elements of a story chronologically is so last century, after all. And then some of Foer's better turns of phrase started to leap from the page. The book, for all its twists and turns, narrative voices and timelines, is about love. What love makes us do, whether good or bad, and all the ways it can manifest itself and permeate our thinking and actions. Foer says at one point: 'They reciprocated the great and saving lie - that our love for things is greater than our love for our love for things'. Alongside the central love story, however, is the story of a war, as the Nazis march across Eastern Europe, bringing terror with them. Most effectively, Foer ends the novel where we started, and closes the circle with all the timelines - the present, an eighteenth century village, and the Second World War - holding hands. The invocation of war and violence as cyclical, inseparable from history, is as chilling as his evocation of love is warming.